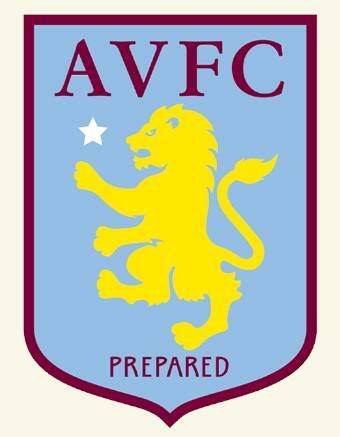 Aston Villas badge has been predominately the same design up until 2007 when it was redesigned, even then it still remained fairly similar. The original containing the Lion was supposedly on the suggestion of William McGregor, a former vice president of the club, who wanted the clubs badge to remind him of his Scottish roots, the lion of course appearing on the Scottish FA crest. In 2007 as is the want in modern football the club decided to redesign the badge, coming up with a very familiar design, the only difference being it had lost its stripes and team name !! It had though acquired a star, to signify the European Cup win in 1982, something which nearly 80% of fans had voted for in an online survey that Villa carried out prior to introducing the new badge. Funnily enough though although just over 40% of fans voted to lose the stripes the club still went ahead and did it. An even lower number, 38%, voted against losing Aston Villa and replacing it with AVFC. Of course although it was good of the club to give fans a say it seems they didn’t actually pay a lot of attention to the results !! The clubs reasoning was that the new badge design was now a refined, modern version of the club's traditional shield, which signifies the start of a bright new era. So there we are, a very short history of what has been a fairly consistent crest ! !